Targeting free and low-cost spay/neuter services to maximize impact. Controlling the birthrate of unwanted dogs and cats is the single most important component in achieving a No Kill Chicago. However, when looking to make an impact on pet overpopulation, all spay/neuter surgeries are not created equal. The most effective spay/neuter programs target the pets who are most likely to breed. Price: To mobilize people who would otherwise not spay or neuter their pets, it has to be a free service. Location: Free and low-cost clinics can best serve populations in need when located in under-resourced, low-income communities where veterinary resources are scarce. High Strays: Communities that have the highest number of stray and roaming animals need free and low-cost spay/neuter. Those pets are most likely to breed. And these high-stray communities directly correlate with low-income and under-resourced communities. Source of Pets Entering Shelters: Communities that bring the highest number of pets to the city pound helps identify where spay/neuter is needed. Lack of Awareness: Outreach and awareness initiatives should be directed to communities where spay/neuter is not widely understood. 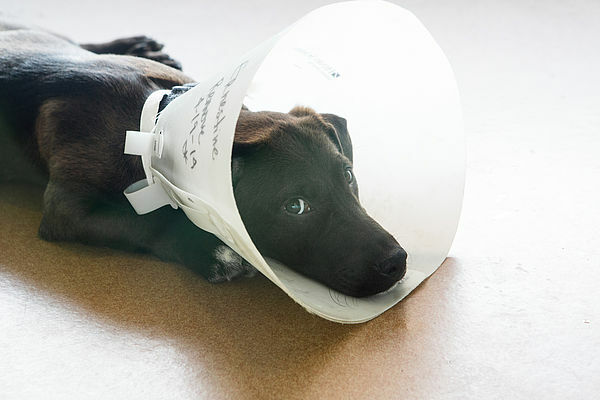 In most communities, approximately 80% of pets are spayed or neutered. But in low-income, under-resourced communities that percentage is usually less than 20%. In 2000, PAWS Chicago opened the Lurie Clinic. We did so after looking at citywide geographic data that showed communities with the highest number of stray pets. 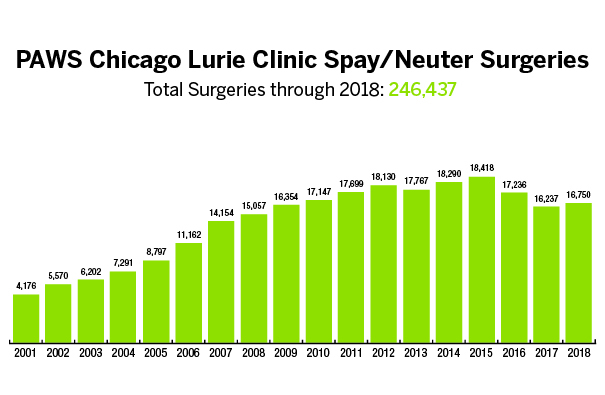 Located in Little Village, the Lurie Clinic serves Chicago’s high-stray, under-resourced communities, where the majority of stray and unwanted pets originate. We also offer mobile spay/neuter services through the GusMobile Spay/Neuter Van, which brings life-saving solutions directly to other neighborhoods most in need. Targeted ZIP Codes: We track which Chicago ZIP codes have the highest number of stray animals, based on number of stray calls. We also track where the animals coming into the city pound are coming from, either because owners are giving them up or Animal Control is picking them up as strays. Using this data, we establish our Targeted ZIP Codes. Public Assistance: We want to provide this service for individuals and families who truly cannot afford it. Anyone who lives in a Targeted ZIP Code and has a Medical Card is eligible to receive free spay/neuter. We also provide free spay/neuter for feral/community cat trappers who are helping prevent cats on the street from breeding using Trap-Neuter-Return (TNR). When PAWS Chicago was founded in 1997, 42,561 animals in Chicago were euthanized. Since then, we have since seen an 87% decrease in the number of pets killed. Since our founding, the number of dogs and cats entering the city pound has been reduced by 52.5%. In 2018, PAWS Chicago performed 16,750 spay/neuter surgeries. Our work is not done. There are still thousands of homeless pets killed annually in Chicago and thousands more in surrounding communities. We will keep going until we build a No Kill Chicago. In addition to the primary mission of reducing pet overpopulation by providing targeted free spay/neuter, we also work to help rescue groups by offering low-cost spay/neuter and medical packages to help them save more homeless pets.